The twin pillars of Mendelssohn’s cello sonatas support a programme thick with familial and other bonds. Fanny Hensel, Felix’s sister, contributes two pieces whilst his friend William Sterndale Bennett is represented by a strong and sturdy Sonata. Fanny Hensel’s Fantasia and Capriccio were both composed in 1829. The former has rich pathos in its opening Andante doloroso and its subsequent fast section has plenty of her brother’s will o’ the wisp about it alongside an admixture of buzzy articulation for the cello and lithe passagework for the piano. Its lyricism is finely calibrated too, though it’s perhaps too slight and occasionally salon-leaning in places for the original designation of ‘Sonata or Fantasia’. The Capriccio is exciting, a kind of song without words with added vim. I’m not sure what happens at 4:09 where there’s a brief swoosh: is it a page turn or an edit? Sterndale Bennett’s Sonata was written for Alfredo Piatti, one of the greatest exponents of the day, and it must have given him an athletic workout, as there are plenty of dexterous corners to be turned in this mid-century example of the genre (it was composed in 1852). There are Schubertian influences in its mellow songfulness, though these soon dissipate into what is more practical – mundane if you’re a stern critic – passagework. The Rondo is expertly realised and splendidly played here, the piano writing of which cleaves strongly to the example of Mendelssohn, as is only to be expected, perhaps. But the aerial vigour of much of the music is very pleasing. 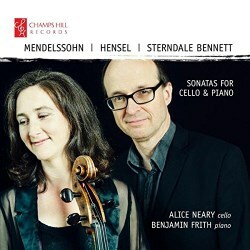 Alice Neary and Benjamin Frith take a vigorously youthful and athletic view of Mendelssohn’s First Sonata, even faster in fact than the recording made by Richard Lester and Susan Tomes on Hyperion, and they were pretty hot-foot about things. There’s quite a breathless quality to the phrasing that is never gabbled but is certainly at odds with a more elegantly refined reading such as those by Tortelier or Meneses, to take just two of many. Nevertheless, the accenting is good, albeit punchy. The more famous second sonata is also tautly delivered and once again faster than the Lester-Tomes duo, though here the structure of the work is more conventional. Lovers of the classic Feuermann-Rupp 78 set of the work won’t necessarily be too sympathetic to the briskness of the Neary-Frith approach to the slow movement but it is of a piece with their keen-eyed, tonally rich response to the sonatas as a whole. This well programmed disc has good annotations and maintains a suitably sensitive balance between the instruments.